The term “body positive” has made a major splash recently, opening up the conversation about body image, body talk, and the growing influence that media has on the topic. 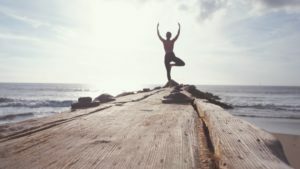 While it’s commendable to strive towards optimal physical fitness, it can become all-consuming, and in many cases harmful, when we forget to practice gratitude for what we already have. Once we acknowledge the fact that just to be alive is a gift, we can strive towards our fitness goals with more patience, compassion and kindness towards ourselves. Of course, loving our bodies is a goal worth striving towards, but body acceptance — simply being okay with where we’re at moment by moment — is crucial for our wellbeing. Cultivating body acceptance helps us be present, instead of getting lost in the past or obsessing over the future. There are various practices that help build positive body image, including cutting out triggers for our self-deprecating thoughts, words and actions. Mission has chosen a few and listed them below. A growing number of studies are linking social media use to body dissatisfaction and eating disorders. Alissa Rumsey, a registered dietitian in New York, recommends unfollowing any accounts that make you feel like your body needs to change, as cited by HuffPost. Research has shown that social media has the power to “alter your perception of yourself and your body,” she said, noting that side-by-side transformation photos can be particularly damaging, since they imply that one is better than another. As for friends and family that trigger negative body image, muting their feeds is also an option. If it doesn’t fit, let it go. As a metaphor for life, it’s important to say goodbye to what does not serve us anymore and make space for the new. Hanging on to old clothing that no longer fits us, or even worse, buying “aspirational” items for a “someday” is detrimental to our sense of self-worth. “Maybe you think, ′I looked so good when I was two sizes smaller.′ But, don’t forget to ask yourself: ‘What was I doing then, to be that size? How has my life and routine changed since then? Was my life really better when my body was smaller?” says Christine Yoshida, an eating disorder and body image counselor in Portland, Oregon. After asking these questions, it’s easier to realize that we are not defined by our bodies, and that a happy, fulfilling life has little to do with our size. See exercise as worthwhile and enjoyable in itself, not as a means to an end. We tend to develop a toxic relationship to “working out” when we view it within the punishment-reward framework. Exercise should not be the result of a day of unhealthy eating, but an activity that boosts our mood and energy levels, and connects our mind and body. We can start to think about physical activity as something we “get to do,” rather than “have to do,” by changing it up and making it something we look forward to. Examples include planning a tech-free run around the park with a friend, or trying out new activities like boxing, aerial silks or zumba. Practicing yoga is also recommended to slow down the mind and cultivate an alignment of mind-body-spirit by focusing on linking breath with movement.